Lee University awarded nine incoming freshman the 2018 Rymer Scholarship on Wednesday. Three Gold Scholars, three Silver Scholars, and three Bronze Scholars were presented at the annual Rymer Scholars banquet on Lee’s campus. 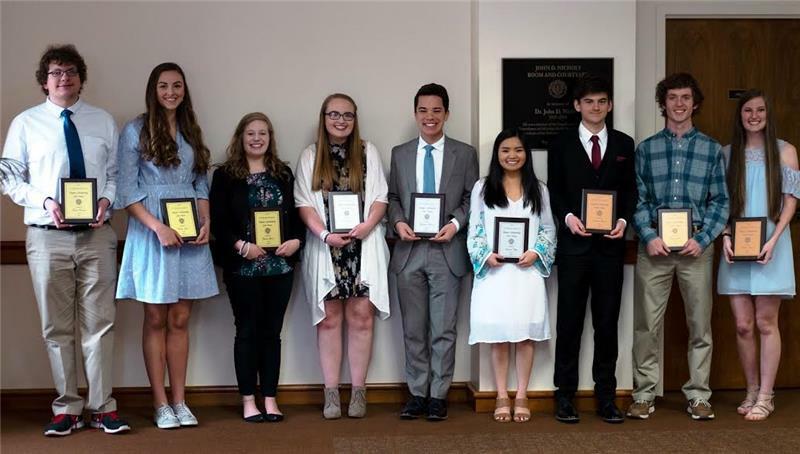 Nine finalists from Bradley Central High School, Cleveland High School, and Walker Valley High School were chosen for the 2018 awards. The Lee University President’s Office, along with the principals from all three high schools, appointed the selection committee. Ms. Harris is the daughter of Angela and Ray Harris. Haley Jones is the daughter of Emily and Jeremy Jones. Mr. Massey is the son of Kelly and Michael Massey. Mr. Akiona is the son of Nathaniel and Sandra Akiona. Cassidy Jones is the daughter of Robert and Shannon Jones. Ms. Ngo is the daughter of Minh and Que-Anh Ngo. Mr. Brewer is the son of Pamela and Wayne Brewer. Mr. Miles is the son of Jo and Mark Miles. Ms. Sims is the daughter of Harrison and Melody Sims. For more information about the Rymer Scholarship, contact Lee’s Office of Admissions at admissions@leeuniversity.edu or 614-8500.